The San Luis Obispo County Planning Commission voted 4-0 on Thursday to approve the proposed 250-megawatt SunPower solar power plant on the Carrizo Plain. A fifth commissioner, Dan O’Grady, whose district includes the Carrizo Plain, was too ill to attend the meeting, but sent along a letter urging his colleagues to vote for the project. SunPower spokesperson Ingrid Ekstrom said she was pleased with the vote and looks forward to the project, which is expected to provide energy for up to 100,000 homes, finally moving forward. 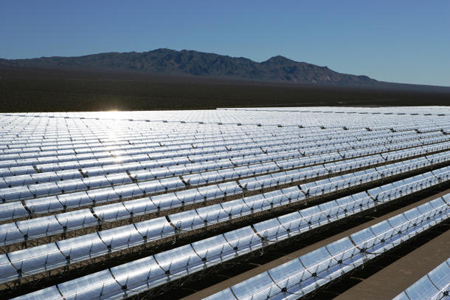 Ekstrom said the solar plant will lead to the creation of more than 350 jobs and an estimated $315 million in direct and indirect expenditures, and about $10 million in sales and property taxes. A second solar plant, being pushed by First Solar, is expected to come before the planning commission at the end of next month. The planning commission decision is subject to appeal and final approval by the county Board of Supervisors. I guess if you’re going to get a song stuck in your head “Here Comes the Sun” ain’t so bad. Between Diablo Canyon and these solar farms SLO County will be a huge exporter of electricity. Fifty years ago nobody would have believed this. I do note the Tribune, in their story today, incorrectly claims the number of homes this plant will supply energy for is 1 million homes. The Tribune further incorrectly states that there are about 1 million homes in SLO County. I understand the Tribune’s reporters leave a lot to be desired when it comes to reporting accurate information, but when there are only 270,000 or so people in SLO County, how does it get by the Tribune’s crack reporters and editors there can’t be 1 million homes in SLO County. For local newspaper reporters the Tribune sure seems to lack basic local knowledge.